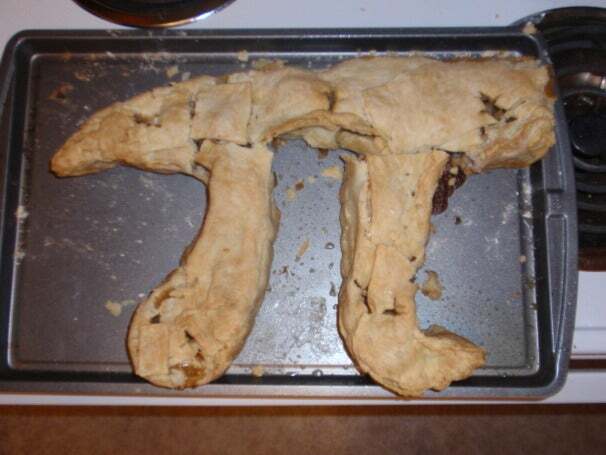 It's a pi pie! Get it? It's that time of the year again--time to rejoice and celebrate that wonderful mathematical marvel, pi. 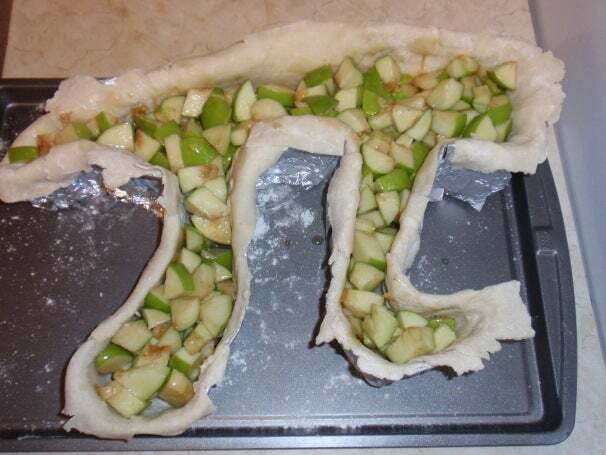 And there's no better way to observe Pi Day than to make an apple pi pie--or as my friend puts it, an apple pi^2. Let's get started! First, I must warn you, you will need lots of patience when making this pi (pun intended), so make sure that you give yourself plenty of time before you begin. 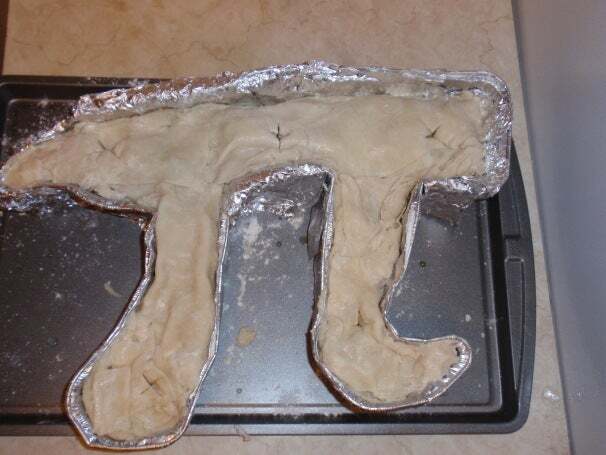 First off, you will need to make a pi mold for your pie. To do this, I used three disposable aluminum loaf pans and a lot of aluminum foil. 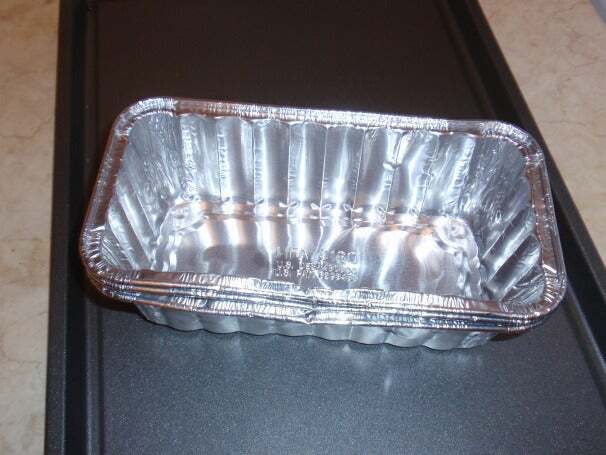 The disposable loaf pans are cheap, flexible, and easy to manipulate. 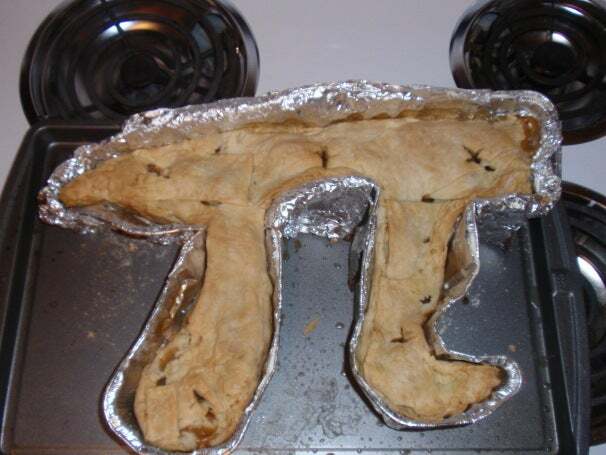 Since I wanted to make a pi-shaped pie, I ran a Google image search on "pi" to find a couple different variations of the letter. Next, I placed two of the pans on a cookie sheet and manipulated them to sort of look like the two legs of the letter pi. This took some looking back and forth between Google Images and the pans to get the shape right. I then used another pan and a bunch of aluminum foil to make the top of the letter. 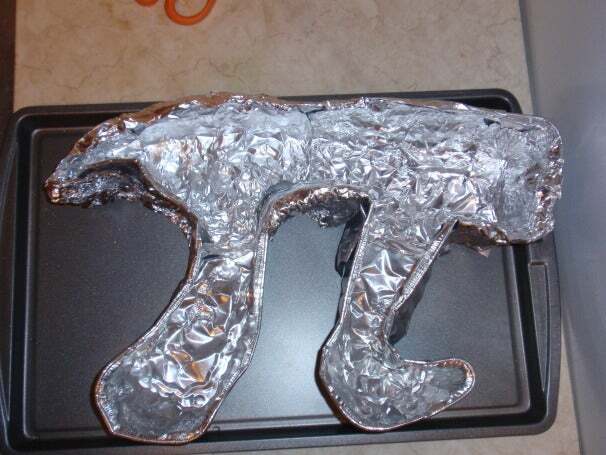 I couldn't tell you how much aluminum foil I used, but you'll want to use enough to make it look like pi, and to build a reasonably sturdy mold. Next, I used a scissors to cut into the pans where the legs are supposed to connect to the top (be careful; these pans have sharp edges after you cut them). Finally, I connected the legs to the top by wrapping aluminum foil around the connections. If you don't have a lot of time on your hands, you can just make a blocky-looking pi--instead of trying to manipulate all of this aluminum into curvy shapes, just use the original block shape of the loaf pans (you can go for the retro 8-bit look!). 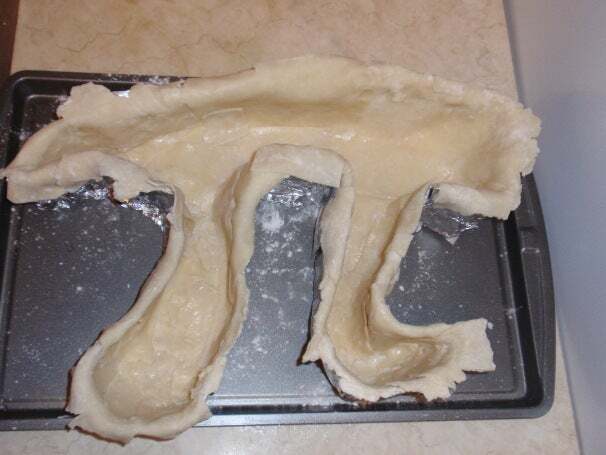 After you have your pi mold ready to go, you'll want to make some pi pie crust. 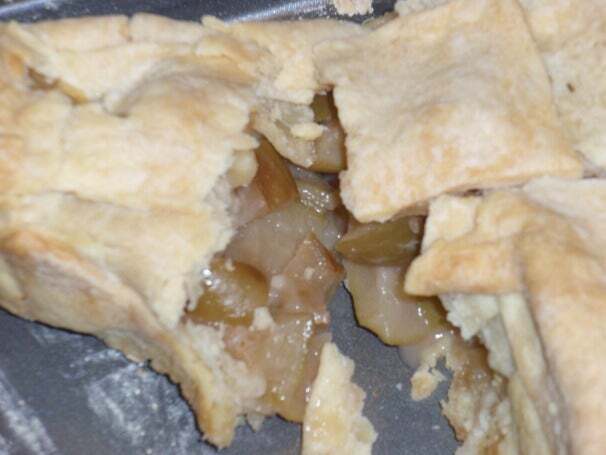 You can use any pie crust recipe or use a pre-made crust; I used this delicious and flaky recipe. Depending on how big your pi mold is, you might need to make more crust. If you aren't using pre-made crust, split your crust into two pieces--one for the top crust, and one for the bottom crust. In the end, I used about three quarters of my dough to make the bottom crust, and the rest for the top. Roll out the dough and cut it into strips. Sift some flour into the pi mold to keep the crust from sticking to it, then lay the strips throughout the pi pan. You will need to improvise here to get around these crazy curves. Finally, I put the pi mold with crust into the freezer to cool while I prepared the rest of the recipe. The pi bottom crust in the pi mold. To make the filling I used a recipe from AllRecipies.com, and it turned out to be the perfect fit for my pi. You can use any pi filling recipe that you want, of course (cherry pi pie, anyone?). Take your pi mold and crust out of the freezer and put in the pi filling. The pi filling in the pi. Next, roll out the last of the dough and cover your pi filling. Make sure that you pinch the top crust and the bottom crust together; otherwise, the whole pi might fall apart when you try to take it out out of the mold. Again, this will take some patience. Next, cut a few slits in the top crust with a fork or a knife to let any steam escape from of the pi pie while it bakes. The final pi crust before putting it in the oven. Finally, put your pi^2 into a preheated 425-degree oven for 15 minutes; reduce the temperature to 350 degrees and bake it for at least another 35 minutes. (Note that you'll want to put the whole thing in the oven--cookie sheet and all--or else it'll fall apart when you go to pick it up.) I like my apples soft, and I also leave the skins on because I'm too lazy to peel them, so I left the pi in the oven for an hour to make sure that the apples and apple peels became nice and soft. When the pi is done to your liking, take it out of the oven and let it cool for a couple hours before you try to remove it from its mold. When you do remove the mold, use a pair of scissors to cut away one piece of aluminum at a time. My pi nearly fell apart because I was trying to take too big of pieces off at once. The cooked pi still in the mold. The cooked pi out of the mold. Last but certainly not least, use all means necessary to consummate your love of pie and hatred of math class by digging in. The delicious gooey pi pie.